Through the Ages is a story of civilization, spanning four ages (Antiquity, Middle Ages, Age of Exploration, Modern Age). As most of these type of games it is about resources, food, politics, leaders, science, development, war, culture and so on. But it doesn't come with a map (read more later on), which is not a big deal at all and might be one of the reasons why this game is often categorized as "CIV-lite". The game is basically a card game, so there are A LOT OF cards (more than 350!) - divided into civil and military cards. Additionally there's a big score board, little player boards, wooden cubes and a nice 20 page rulebook. All of the components are of high production quality, the layout is very clear and easy to access. You can play the game in three different versions (introduction/advanced/full), which is a good opportunity to learn the game step by step. Each player starts with a little player board where he keeps track of the stats of his population. He develops certain buildings to gain food and resources, as well as culture and science points. Certain leaders and governments offer different special abilities and advantages. It's also important to take care of your military strength, and also World Wonders might contribute to a successful strategy. I was really surprised how well this CIV game works without using some typical map of the world to mark the owners of the different territories. 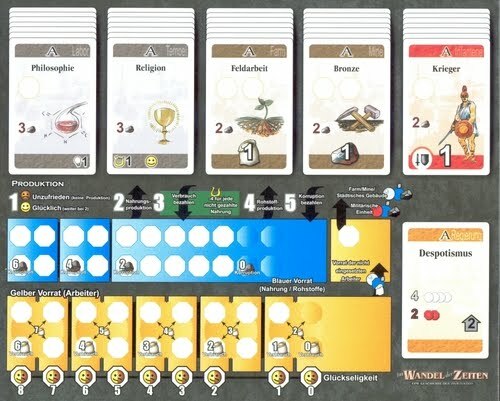 You develop your population just by using your player board and by laying out certain cards (buildings, military forces, leaders, government, World Wonders, and so on). 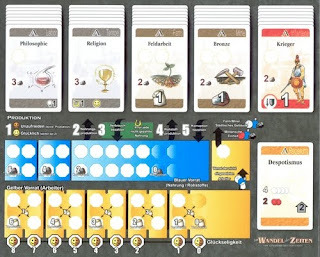 Through the Ages is a well-balanced and quite heavy game, with a lot of choices and possibilities. Each game evolves differently and it is fun to see how your nation grows. 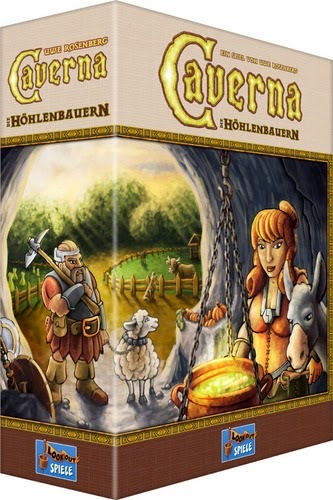 Overall this game can definitely be recommended, especially as the playing time is much lower than for most of these heavy civilization games. 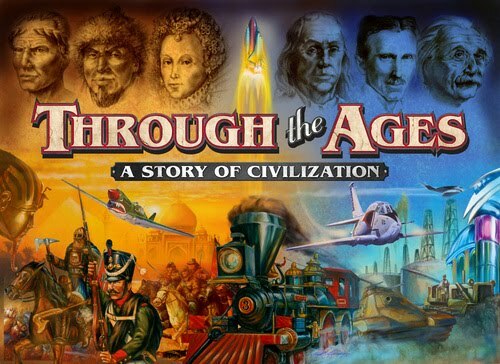 From the publisher: Through the Ages is a civilization building game. The goal is to develop your civilization, not to destroy other ones. Military strength is just one aspect of your nation, as well as population, production or science. It is up to you which aspect you will concentrate on, more or less, but you should not underestimate any of them while building your civilization. Victory is achieved by the player whose nation produces the most culture during the game. However, there are many ways to produce culture: through religion, literature or drama, by building wonders, by utilizing cultural persons etc. Considerable amount of culture can be gained even via wars or aggression.